The people of Hawaii are described as being relaxed, genuine and kind. These are all qualities that may be attributed to a single common phrase you may see while touring the islands, whether on a tshirt, a bumper stick or perhaps even a tattoo — “Lucky We Live Hawaii”. This well-known slogan perfectly represents the carpe diem lifestyle of the islands which promotes savoring each moment of the day. Instead of being impressed by one’s salary or home size, Hawaii residents are more concerned with how one lives. This mentality is one of the many reasons our humble group of islands in the middle of the sea is known for being one of the least stressed, most happy places in the world. You’re considered a little bit richer each time your child touches her toes to the sand, you catch the set of the day at your favorite surf spot or you’ve beat your best time to the top of Diamond Head to make it for the sunset. ADVENTURE. Research has found chronic stress to be related to a higher risk of dying from stroke; however, while chronic stress is incredibly harmful, not all stress is alike. When our bodies undergo immediate stress, the adrenaline hormone takes control, helping us to take action. “A single adrenaline burst that comes and goes very quickly is a good thing … it gives you energy and gets you ready to mobilize for immediate action,” says Esther Sternberg, the director of the Integrative Neural Immune Program at the National Institute of Mental Health. While some may say skydiving or jumping waterfall cliffs is dangerous, we think it’s just the way to give your adrenaline a good kick (after you take all the necessary safety precautions). SILENCE. It is not easy to find alone time in a time where our lives are ruled by technology at our fingertips; but, solitude and silence allows us to relax and restart our brains, causing us to be far more productive. Solitary time can be used for reflecting on life which leads to better relationships all around, including the relationship we have with ourself. FAMILY. 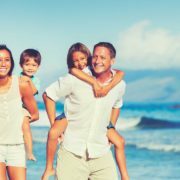 Ohana is a principle that, for most Hawaii residents, takes priority. Family sits on an entirely different pedestal than work, allowing the people that matter most in our lives to come first. Whatever “Lucky We Live Hawaii” means to you is irrelevant to us here at Big Wave Shrimp. We welcome all to enjoy time with us in Haleiwa, and will always do our best to help make your lunch, dinner, day and lives a little better. Mahalo a nui!